Ashley Wray at Nicole Bridger's shop in Kitsilano. Photos by Sue Frause. At the Autumn 2012 Eco Fashion Week in Vancouver, I met Ashley Wray during the Nicole Bridger style show at the Vogue. 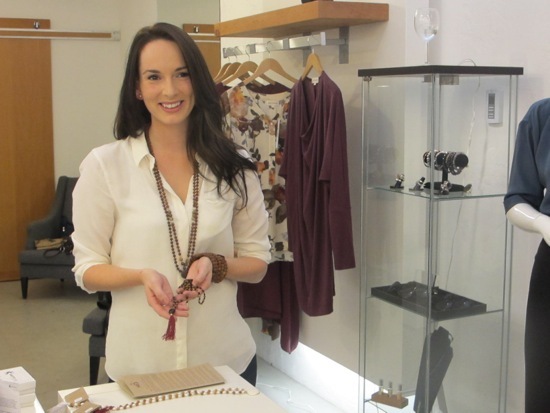 Ashley and her husband Matt own the Vancouver-based ethical jewelry company Mala Collective. So what is ethical jewelry? The jewelry in the Mala Collective is handmade in Bali, Indonesia where Ashley describes it as being "sustainably harvested, fairly traded and ethically produced." Made from rudraksha seeds (which grow inside what looks like a blueberry), the seeds are transformed into beads to make malas, prayer beads or necklaces made of 108 beads. 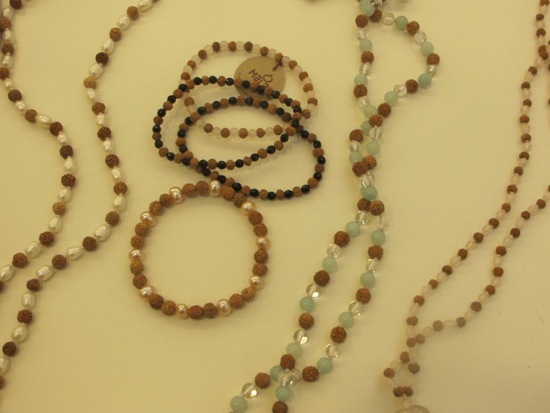 The combination of the beads with gemstones purportedly produces a calmer mind, body and spirit. The jewelry, which also includes bracelets, is both fashionable and functional. Ashley says each gemstone carries different intentions for the wearer. Those can range from relieving anxiety to improving circulation, healing emotional wounds or protection during a journey. "We're always looking at ways to highlight the idea of setting intentions and living a conscious lifestyle," says Ashley. Celebrities have embraced the jewelry, including the Julia Roberts character in Eat Pray Love, along with Sting and fashion designer Donna Karan. The Mala Collective will be featured at Nicole Bridger's Spring/Summer installation style show at Vancouver's Eco Fashion Week, April 21-24. The opening night event is Sunday at The Portside Pub in Gastown. "Our jewelry will be a perfect complement to Nicole's new collection, full of pieces in all the trending colors this season," said Ashley. The Nicole Bridger collection, BE, was designed for a new generation of women who want to look effortlessly chic while maintaining a commitment to the earth and its people. Bridger is known for her draped designs and use of high quality, ethical and sustainable fabrics.